A key game and one, which according to the prevailing wisdom, was a potential banana skin for Real Madrid and their hopes of regaining the La Liga title. Osasuna came into the game on the back of three wins and three draws in their last six games, a run of form which has saw them move into sixth position whilst Madrid have sneaked victories away at Rayo and Betis before being held at Villarreal in their last three away games. This was the game were Madrid would crack again, drop more points and allow Barcelona to move that little bit closer. Instead, it was a game which Madrid won comfortably and with some ease, only really coming under a period of pressure for 20 minutes early in the second half. Both sides adopted the familiar 4-2-3-1 which is prevalent in La Liga. For Osasuna, the inclusion of Damia at left back with the attack minded Roversio at right back was perhaps surprising and it was a move which, whilst indicated the attacking intent of Mendilibar, was ultimately one which would not pay dividends. Real Madrid made four changes from Wednesday night’s game away at Apoel. Albiol, Marcelo, Alonso and Granero all came back into the side. Under Mendilibar, Osasuna play an aggressive pressing game with direct passing and a high line. Yet it was Madrid who closed down Osasuna early on and imposed themselves on the game. A key moment of the game arrived in the 3rd minute. 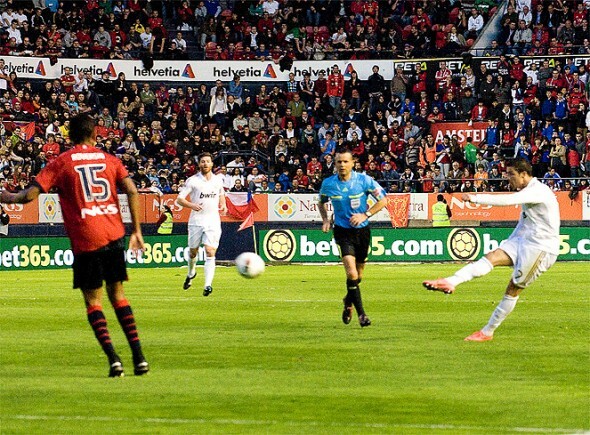 Roversio was caught upfield when an Osasuna move broke down. He was too far ahead of the ball and Ronaldo exploited the space vacated drawing Sergio out of his comfort zone in the central defensive position. The resulting foul delivered a caution for Sergio limiting his ability to adopt a physical approach for the remainder of the match. The warning was not heeded by Osasuna as Roversio was frequently caught out of position in the 1st half to such an extent that it seems likely he was encouraged to get forward and attack Marcelo. It seems possible that Mendilibar wanted Roversio and Cejudo to create 2 on1’s against Marcelo given that Ronaldo seldom tracks back and offers any defensive cover. In the 7th minute the opening goal for Madrid arrived. Ronaldo attacked Roversio who gave him far too much space with Punal, directly behind Roversio, offering nothing. Ronaldo’s cross was met spectacularly by Benzema on the volley. Osasuna gradually settled into the game and despite, somewhat surprisingly given their style, having more possession than Madrid by the latter stages of the 1st half, their main opportunities were via set pieces. They seldom had any men in their opponent’s penalty area. Nino was drifting to the left leaving space in the centre that Raul Garcia was not exploiting. Punal and Nekounam were too deep to offer anything of an attacking threat. Leo, who was stationed on the left, provided nothing in either an attacking or defensive sense. Madrid’s 2nd goal was another spectacular effort. A strike of close on 30 yards from Ronaldo. Marcelo and Benzema overloaded the left wing forcing Roversio back and Sergio was reluctant to commit already being on a caution. With time and space in a central position, and Punal unable to close him down, Ronaldo opened up for his first goal of the game. The third goal arrived moments later. The Osasuna high defensive line was punished when Granero played in Higuain who deftly flicked the ball over Fernandez. Lekic replaced the ineffective Loe at half time and adopted a central position with Nino moving to the left. The move paid dividends almost immediately. Roversio moved forward and whipped in a cross from the right. With Albiol and Ramos now dealing with the physical presence of Lekic, Nino was able to drift in behind Arbeloa and head in for Osasuna. Lekic barely saw any of the ball in the first 20 or so minutes of the second half but his presence in a central position meant Ramos and Albiol no longer had the time and space they enjoyed in the first half when Nino moved to the left. The substitution also allowed Nino to start on the left and cut infield. Madrid again beat the Osasuna offside trap in the 57th minute but after rounding Fernandez, Higuain collided with Ronaldo in a moment of farce with Higuain only requiring to knock the ball into the empty net. With Osasuna playing at a higher tempo and playing further upfield and closer to the Madrid goal, the game was much more competitive. That changed with the 4th goal for Madrid in the 69th minute effectively killing the game. A soft foul was awarded to Madrid on the edge of the area and Ronaldo scored courtesy of a deflected free kick. This was his 40th attempt at goal from a free kick since he last scored from a free kick. Fernandez was cautioned in the immediate aftermath of the goal for dissent. He appeared to be still lining up his wall when Muniz Fernandez blew for the free kick to be taken. The game as a contest was now finished and Madrid added a 5th goal in 76minutes. Again, Ronaldo comfortably beat Roversio and his cross was converted by Higuain. Madrid created further opportunities but a combination of poor decision making and poor finishing meant the game finished 1-5. For a side that relies on a physical approach and direct passing, the inclusion of Nino ahead of Lekic was surprising unless Lekic was not fully fit. Even allowing for this, surely it would have been better to utilise Lekic for an hour or so and then withdraw him hopefully whilst you were still competing in the game? Instead, the introduction of Lekic when trailing 3-0 had an effect but it was never to be enough to even salvage a point for Osasuna. Alonso returning to the Madrid team was important, linking the defensive and attacking components together. His ability to switch play or hit first time passes and stretch Osasuna was important early on in establishing Madrid’s dominance and control of the match. The high line of Osasuna can only work when the midfield presses effectively preventing the opponent from having time to choose passes. When Osasuna failed to press, Madrid took advantage of this. Not a classic performance by Madrid but a ruthless one. Not the best performance of the season you’re right but maybe one of the most important. Everybody thought it was going to be a tough game but Osasuna were not allowed into the game. Very nice, not a Madrid supporter, well thought game.